Hello, and Welcome to my Recovery Site. This is an unofficial site and is not endorsed by Cocaine Anonymous, Alcoholics Anonymous, or any other 12-Step Group. I have been in recovery for three years and do not proclaim to be an expert on recovery. This page is merely here to inform, and point you in the right direction. "Cocaine Anonymous is a fellowship of men and women who share their experience, strength and hope with each other so that they may solve their common problem and help others to recover from their addiction. The only requirement for membership is a desire to stop using cocaine and all other mind-altering substances. There are no dues or fees for membership; we are fully self-supporting through our own contributions. We are not allied with any sect, denomination, politics, organization, or institution. We do not wish to engage in any controversy and we neither endorse nor oppose any causes. 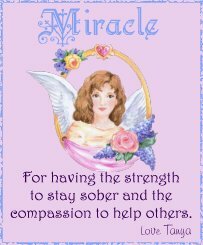 Our primary purpose is to stay free from cocaine and all other mind-altering substances, and to help others achieve the same freedom. NOTE: SOME OF THESE LINKS WILL TAKE YOU TO URL'S OUTSIDE OF THIS SITE. PLEASE PRESS THE "BACK BUTTON" ON YOUR BROWSER TO RETURN TO THIS SITE. Cocaine Anonymous is a Fellowship of, by, and for cocaine addicts seeking recovery. Friends and family of cocaine addicts should contact Co-Anon; a Fellowship dedicated to their much different needs. NOTE: This GuestBook is not the same as my Serenity Card Shop GuestBook. Feel free to sign whichever one you want. I am trying to keep them seperate for a reason. If an entry concerning this page ends up in my Card Shop GuestBook, I will move it here. 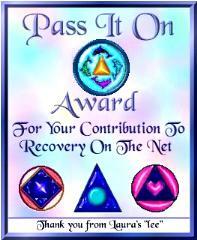 I have worked very hard on this site and I, Thank you, Laura, for this award.